Sony has given a new HD polish to its many of the games that have been loved for years and the Ratchet & Clank Trilogy is trilogy of Ratchet & Clank series. The Ratchet & Clank Trilogy is a high-definition and remastered collection. The Ratchet & Clank Trilogy was first announced on March 2, 2012, after the game got listed on AmazonFrance’s official website, but got official confirmed on March 15, 2012 by Sony Computer Entertainment. The game has been developed by Games in union with Idol Minds, and published by Sony Computer Entertainment. The story remains unchanged with remastered versions in the game as the trilogy has included three original games. The overhaul graphics make the game very attractive with a complete HD stereoscopic 3D support. 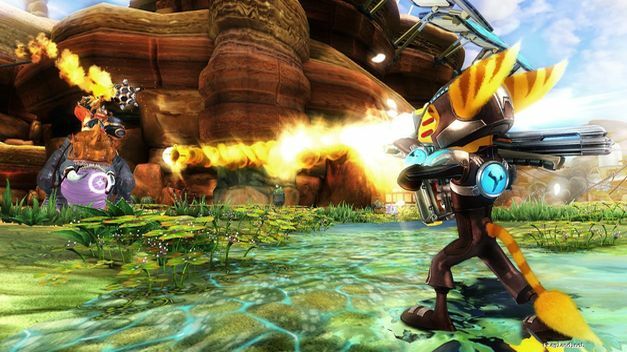 In the gameplay character includes animal-like alien mechanic Ratchet and his tiny robot chum Clank.The game actually includes three original PS 2 games, Ratchet & Clank: Up Your Arsenal, Ratchet & Clank: Going Commando and Ratchet & Clank. It also offers multi-play gameplay up to 8 players over the PlayStation network for Ratchet & Clank: Up Your Arsenal. New glorious graphics make the game look even better. The game features 1080p and 720p stereoscopic 3D support giving game an astonishing look that attracts the gamers. Experience the whole new HD adventure with Ratchet and his tiny robot chum Clank, I bet every gamer would love the latest adventure of Ratchet & Clank series.